This easy Slow Cooker Chicken Enchilada Quinoa recipe is simple, healthy, and full of all of those Mexican flavors you crave! *Whew* we made it through the holidays gang! I am always so torn when they are gone. On one hand, the stress of decorating, gift buying, cooking, and entertaining is done. But then again the decorating, gift buying, cooking, and entertaining is done. Now you can see why I drive Kevin crazy. One minute I want something, then I am like "Meh.....whatever". Last year I told him that we needed to take the Christmas tree down because the needles were starting to fall off (it was like January 10th or something crazy like that), then I sat on the sofa pouting for two hours after it was gone. Anywho, after the rich, decadent, sugar-laden dishes and treats we have been noshing on for the last month or so, lightening up things seemed to be a great idea. Let's walk away from the table not feeling like we need to lay down and hibernate for 2 months, shall we? One of my new faves is quinoa. I know I am a little slow to jump on this bandwagon right? I blame it on the family (which always seems to work for me). When I would mention quinoa I would get this wrinkled up nose face. You know that face like they just stepped in something really stinky? I was like, "Fine, don't be healthy then!". I begged and pleaded, and then finally just snuck it in masked with a ton of cheese. Once they ate it and liked it, I sprang it on them that they had just had their first taste of quinoa and didn't all fall over dead. Now that I have them all, pretty much, on board with the quinoa thing, I have started using it in place of rice, or pasta, in my casserole dishes. Recipes like these Salmon Quinoa Patties, or this Mediterranean Quinoa Salad, have become big-time favorites. This time I decided that I not only wanted to lighten it up, I wanted to make it working Mom-friendly too. I have really been determined that I am going to make good use of my slow cooker this year. Even though I work from home, I love the fact that I can throw a bunch of ingredients into my slow cooker and then, besides making my house smell fabulous all day, dinner is ready when I am tired and just looking to relax. Then to make it even more fun, I wanted to use my favorite flavors, Mexican. I could live on Mexican food if I had too, and trying to make some of my faves healthier can be a bit tricky. But by using the quinoa, black beans, and half of the cheese (trust me, you won't miss it), this dinner is not only guilt-free, it tastes great! Warm a flour tortilla in the microwave for a few seconds, and a tiny sprinkle of cheese, and a couple spoonfuls of this casserole. Wrap it into a burrito, and bake it in the oven at 350 for about 20 to 25 minutes. You can even make a little sauce of Cholula and fat-free Greek yogurt. OhhEmmmGeeee fab! Trust me, would a woman that ate them for lunch 3 days in a row lie to you? Slow Cooker Chicken Enchilada Quinoa. It is simple, healthy, and full of all of those Mexican flavors you crave! In a large skillet, cook the ground chicken until no pink remains. Place in the slow cooker. Add in the uncooked quinoa, the black beans, frozen corn, diced tomatoes, garlic, onion, and jalapeno, water, enchilada sauce, chili powder, cumin, coriander, salt, and pepper. Stir to combine. Cover the slow cooker and cook on high for 3 hours or until the liquid is all absorbed into the mixture. Remove the lid and stir everything again. Taste and adjust seasoning if necessary. Stir in the half the cheese and sprinkle the other half on top. Replace the lid and let the cheese melt. Top with the chopped green onions and cilantro. If you like this recipe, you might enjoy these as well. Thank you for sharing this week, it looks delicious! Thanks TR! Thank you for being such a wonderful host!! Mmmmm - quinoa!!! I love that stuff. 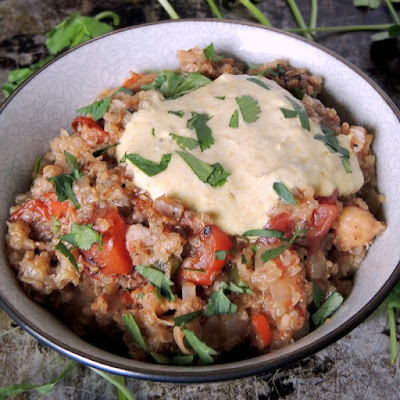 ;) I haven't made a quinoa dish in my slow cooker yet - I need to try! I can't wait to try this amazing casserole! I have a Cuisinart slow cooker with a non-stick insert...cleanup is SO easy that I use my slow cooker much more often now!! I have total slow cooker envy right now! I need a new one soooo bad! Ya, it is kind of one of my resolutions this year. I forgot how awesome a slow cooker can be! Love the Mexican flavors in this great slow cooker dish, Bobbi! You got my vote for winner of the week. Oh, thanks so much Stacy!! Yea, I know the feeling of the scrunched up noses at the sound of the word quinoa. This may be the recipe to get my husband to eat it. Haha I hate that face! I hope it works!! I hate taking my Christmas tree down too. It is still up! Now I would love this recipe, so healthy, easy and full of flavor. Cheese does get the diehards to try anything! Sounds delicious, Bobbi! This is such a bright and colorful dish. Sounds amazing! I think I am in healthy heaven reading this recipe! My family loves Southwestern and Mexican cuisine, so any way that we can get it more healthy with less impact on my hips is a welcome recipe indeed! Happy and Healthy 2015 Bobbi! Oh, if you love those flavors then you will love this. I always love it when I can eat healthy but not feel like I am! I'm like you - except I always weasel my way into leaving the Christmas tree up until January 15...as a birthday present! Mmm...you had me at slow cooker. Or maybe it was Chicken. No, it may have been enchilada! Looks so good! Count me on board the quinoa train, too! I need to start using it as a sub in my pasta recipes (such a good idea, by the way). And I drive myself crazy during the holiday season as well, so no shame in going a little bit overboard :) happy new year! Can't wait to try this in my new slow cooker! Toot toot!! I can't wait for you to give this a try! I love quinoa and make something similar; it's always a hit in our house! I've never ever used quinoa in the slow cooker but now I want to try this. I can't believe this came out of the slow cooker! Love it, and totally dig the idea of wrapping it into a burrito. If not for the fact that I KNOW you are telling the truth, I would swear this could not possibly be healthy. I am, almost, jumping up and down with happiness...I just need a few more workouts to really make that happen! Haha you and me both Betsy!! How much cumin? it's listed in the directions but not the ingredients. I am so sorry Catherine! It is one tablespoon of cumin. Do you happen to know the calories in one serving? No, I am sorry. There are several online calorie counters though. I did the math and calculated a mere 285 calories per serving if you divide into 6 servings- entire recipe comes out to 1,700 calories. 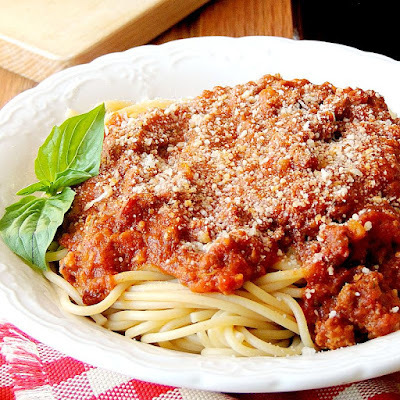 I'm making this now- can't wait to have it for dinner tonight! That's impossible! The black beans alone are 624 calories per cup and there are nearly 2 cups in this recipe. I calculated 590 calories per serving assuming 8 servings. Just copy and paste the ingredients in a recipe calculator. I usually use calorie count's recipe calculator (don't know if links are allowed but just Google it). Nope - there only 220 calories or so in a cup of canned black beans. Checking on the Water.. It is plural (cups)...just checking if it should be more than one...cant wait to try! I am sorry Lisa, I just saw this comment :( I hope everything turned out OK. I would love to know how it came out! How much salt and pepper should I use? Hi Andrew, I just salt and pepper to taste. So I would start out with a good sized pinch (up to a teaspoon) and then taste at the end and add more if needed. Thanks for posting this recipe, Bobbi. It's great! We tried it out tonight (with a few super minor adjustments to our tastes) and it was a winner. Love how simple it is and that the timing is spot on so that things don't get overcooked. We're adding it to our recipe repertoire. Thanks again! Oh that makes me so happy to hear! It is one of our family faves too!! Hi Bobbi! I was wondering if it would be possible to cook this in the slow cooker on low for 6 hours? I leave my house in the morning and some nights I don't get home until about 6 or 7, so I'm not sure if I'd want the slow cooker sitting at the warm setting for most of the day. Thanks! I have never tried cooking it on low, so I can't say for sure. I am thinking the only thing that might change is the texture of the quinoa, it might get a bit overcooked, but I am not sure. I know there are several rice recipes for slow cookers that say you can cook them on low and I tend to treat quinoa the same as I do rice. Let me know how it comes out and I will add your info to the recipe. Wondering if this worked on low? Want to set and forget before going to work...i guess i could always cook on high for 3 and then let stay warm? We just made your recipe now! I am counting down until 3 hours from now! I can't wait! Thanks for sharing! Do you ever have recipes that are both gluten free and sugar free? My mom can't eat both....just wanted to see! THANKS! I hope you enjoy it as much as we do Jessi (my daughters name is spelled the same way). As far as sugar free, are you talking about recipes free from adding sugar, or are things like agave or the natural sugars in other fruits and veggies an issue? What is the actual serving size?? This can be anywhere from 6 to 8 servings, depending on appetites. Can I substitute the ground turkey for ground turkey or shredded chicken? Oh definitely. You could sub any lean ground meat you would like. 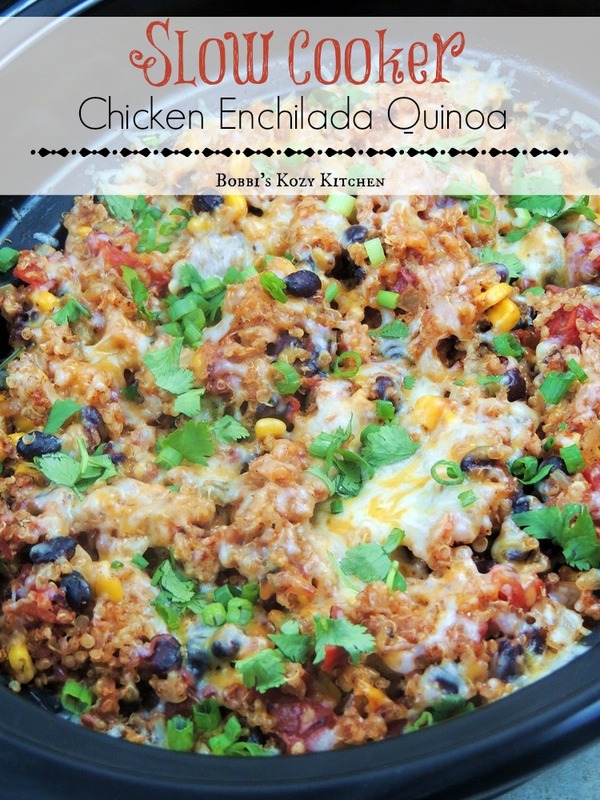 Love Quinoa, having the Slow Cooker Chicken Enchilada Quinoa for dinner tonight, it smells wonderful cooking, bet it will taste as good. I am soooo excited! I know you will love it! What would be a good substitute for the fire roasted tomatoes? We are a no tomato house, lol. Hi Nicole, is it a texture thing with the tomatoes, or is it an allergy? If it is texture you could always use tomato puree, if it is an allergy I was just reading on a website that one lady will add pumpkin puree to get the earthiness and some diced zucchini for chunk. You could always just omit the tomato all together if needed. Thanks for the recipe!! I made this today, and my quinoa took a LOT more water than this recipe called for. I had to add 3 cups more of water to get the quinoa done. Did anyone else notice this? When I make this next time, I think I will also only add 1 cup of quinoa instead of 1.5 cups because the quinoa overpowered the chicken a little. It does taste really good though! I added chedder cheese, sour cream, and avocado to the final product. This will be great for lunch tomorrow. I am sorry that you had an issue with the quinoa in this recipe. I haven't had that problem, and haven't heard from anyone else, but I am glad that you were able to rectify it and enjoyed the recipe. We used the leftovers in burritos once, and enchiladas another time. I love recipes that are just as good the next day! Thanks for your input, I will make sure to recommend 1 cup to anyone else that has troubles. I make this recipe and I use 2 cups of liquid. I use chicken or bone broth sometimes instead of water. Hi! Could this freeze? I am looking for good meals to cook ahead, portion out, freeze and then defrost night before for lunch at work. Recipe seems perfect for this. How long would this last without freezing? Thanks! Hi Fiona :) I am not real sure about freezing this. I think the quinoa might get a bit mushy, but I am not sure. It is kind of like freezing a rice or pasta dish. But if you try please let me know how it works out OK? I've just made this this Sunday, prepped it into my freezer containers for the week. I froze them and thaw them for lunch. I simply didn't add the top layer of cheese until i put it into my meal-prep containers. Everything is perfectly fine and tastes wonderful, as good as it came out the first day I cooked it. How many calories per cup if made exact to the recipe? I am not sure, but another reader posted this above "285 calories per serving if you divide into 6 servings- entire recipe comes out to 1,700 calories" I am not sure what it would breakdown to cup per cup. Trying this now! We froze everything beforehand as make-ahead. Added the uncooked quinoa, water and cooked chicken on the spot. We will see how it turns out! Did you use a 6-quart crockpot? Hi Erika, I have never tried it since I am a red sauce girl :) but I am sure that it would be just as tasty! This is my favorite quinoa recipe! I first saw it in April of last year and have been making it ever since. I take it to potlucks, when I take meals to neighbors, when people come over....it's my go to meal that is easy and healthy. Thanks for the great recipe! That make me sooo happy Vikki! This is one of my fave go-to recipes too. Thanks so much for letting me know, I get so excited when people love my recipes as much as we do!! I just made this for me and my mom who was coming over for dinner tonight. She is so bored with chicken recently, so I wanted to try something different. We both had never had quinoa. When she came in, she asked what smells so good, it did smell wonderful while cooking. She loved it... she even had seconds! Thank you for this recipe, it was delicious and we decided we like quinoa, too! I have to tell you - this is my go-to recipe at the moment! My husband and I are trying to eat healthy and LOVE this recipe! This is AMAZING! We end up using a bit more peppers and also hot sauce, because we like it spicy and wrap it in tortillas for dinner. THANK YOU FOR SHARING! This looks super delicious! I'm just wondering what you eat it with? Or do you eat this on its own like a stirfry or something? Usually enchiladas are made with tortillas and this recipe looks like it's just the stuffing/sauce? Maybe I'm confused by the fact that you called it enchiladas so I was expecting tortillas somewhere. Can't wait to try it! I'm trying to limit my cheese intake (sad but true). Could I leave it out? Would it still be good? can fresh corn be used? yay making it now. but with 4qt cooker. this is my first ever slow cooker meal! Could you make this with leftover roast turkey or chicken? I would think so. If you are afraid it might dry out the meat just add it for the last hour or so, but I think there is enough liquid in the mixture to keep it moist. Let me know how it comes out! Could you substitute a taco seasoning packet for the spices that are listed? Sure Heather I think that would work out fine. Could you double this recipe in a 6 quart crockpot? I actually make this in a 6 quart slow cooker and it comes up to about midway, maybe a little higher. I am not sure if you could double it or not. Has anyone tried this with chicken breasts that are raw? I need to leave all day in crockpot. I can't say that I have. I know there is some worry as to whether or not the chicken would be cooked through in just 3 hours. I would suggest chopping the chicken, then sauteing, before placing it in the slow cooker. i know i'm late to the party, but i just made this and am obsessed!!! it's soooooo good!!! Never to late :) I am so glad that you enjoyed the recipe!! I am super excited to try this recipe tonight, i was wondering if i can use a can of corn rather than the frozen corn? I would think so, just make sure to drain the corn before adding it. Enjoy! Would I be able to bake this instead of using a slow cooker? I am sorry, I don't know, I have only made this in the slow cooker. Bobbi, I somehow stumbled upon this recipe and stashed it away a couple of months ago. I loved the concept of this recipe because it used quinoa and it sounded so healthy and delicious! I finally made it last weekend and boy, this was FANTASTIC!!! It was so easy to make and I followed the recipe to the tee, except the only thing I did was saute the onions and garlic to soften them before I put them in the slow cooker. Everything was SO good, and I also sliced up some avocado and tossed it into my bowl, along with the green onions and cilantro. Thank you so much for this great recipe! Oh, and I am going to be making your Bacon, Leek, and Artichoke Bread Pudding for Easter in a couple of weeks! I thought it make for a great side dish! I'll let you know how it goes! Thanks again! I made this last night and this was FANTASTIC!! Can't wait to try more of your recipes. Made this last night and it was a hit with my incredibly picky boyfriend! It tastes just like the enchilada casserole that he makes but MUCH healthier. This is such a great alternative to what we usually make. Oh my lord it is delish!!!! I cooked for 6 hours on low overnight and heated it up for lunch! I could eat this every day for the rest of my life. Sounds delicious! What could I substitute for enchilada sauce? Or can I just leave it out? WE had this tonight and I wish I had realized I was out of Mexican chili powder. Regular chili powder gave it a taste more like chili. I used ground turkey (what I had) and because I'm feeding people who don't like spicy, I left out the jalapeno. My cooker runs hot, so when I checked it at 3 hrs it was a bit overdone, but that is no fault of the recipe. We enjoyed this tonight and will have again. Can I use chicken breast? If so, do I need to cook it before putting it into the slow cooker? Sure, just dice the chicken up and cook it like you would the ground chicken before you put it in the slow cooker. Has anyone ever swapped the quinoa for rice? Or chicken for ground beef? Thanks! Just trying to use up ingredients I have, it sounds delicious the original way too! :) thanks for sharing! Can I freeze the recipe after cooking? I have never tried freezing it since we eat it so fast :) but I would assume that it is just like freezing rice dishes. Could you use raw whole chicken breasts, cook on high for 4 hours, and then shred and mix right before eating? Just trying to save as much prep time as possible so I could do this at home on my lunch hour. I would try cutting the chicken into bite sized pieces. The quinoa might be a tad overcooked at 4 hours. I am just not sure since I have never tried it. Let me know how it works out. Any idea how to make this without a slow cooker? I am sorry, I don't know. I developed the recipe for the slow cooker so I am just not sure. You could possibly bake it in the oven but, since I haven't tested that method, I am not sure exactly how long you would bake it. I do have a baked rice casserole here on the blog so maybe go by those guidelines? I just can't promise how it would turn out. Sounds delicious! Can I leave out the enchilada sauce or substitute it with something else? Hmmm I am not sure how it would taste minus the enchilada sauce. If you don't like red enchilada sauce you could try green. Possibly salsa? I am just not sure since I have never tried. Hello! I'm super excited to try this recipe tonight. I've been looking for a healthy crockpot recipe and this looks delish! I am a bit of a wimp when it comes to spice, so how spicy would using just 1 jalapeno be? I feel like it wouldn't be too spicy but just wanted to check beforehand. Oh yay!! So glad you are giving it a try. I would say that if you remove the ribs and seeds from one jalapeno you will be safe as far as the heat level goes. Enjoy!!! Okay thanks for the tip!! Could you use boiled shredded chicken in this dish without it getting to dry? That's what I usually use in my enchilada recipes and I was curious if it would work in this dish as well. You know I have never tried that? I am not sure if it would dry out. Maybe you could stir it in at the end? I used boiled shredded chicken that I had previously made and froze. I thawed it overnight and just put it stright in with the rest of the ingredients. It was perfect. Based on other comments I doubled the water to 2 cups and the chicken stayed moist the quinoa was perfect.Everyone loved it. I made this for a work potluck. It turned out fab. Everyone loved it. I didn't double the water, but threw in a pint of pico de gallo instead of water. I am thinking about adding eggs to this for breakfast burritos. This sounds soooooo good! Has anyone tried this on low yet? or by subbing a taco packet for the seasonings? I want to make this for dinner tomorrow. I am not sure cooking on low would be a good idea since you need the high heat to cook the quinoa. What are you thinking about subbing the taco seasoning for? Bobbi - I made this yesterday and hope it answers some questions people had (like myself!). I did sub taco seasoning. I also doubled the recipe. I set this on low for 6 hours and let it default to warm until I got home (I work all day!). When I got home, I made the quinoa separately - deliberately under cooking it just a tad. I then added it in with the cheese. I reset the slow cooker for 30 minutes and let it finish cooking to let that quinoa absorb. it turned out PERFECT! this is definitely in my rotation now. I found this recipe on Yummly. I cant wait to try some of your other things! Awesome!! Thanks for letting me know and I am so glad you enjoyed it! I can't wait to try this amazing dish!